Stock #175587 iNCREDIBLE BOAT! TURN KEY PERFECT CONDITION, TONS OF EXTRAS, YOU GOTTA SEE IT TO BELIEVE IT! 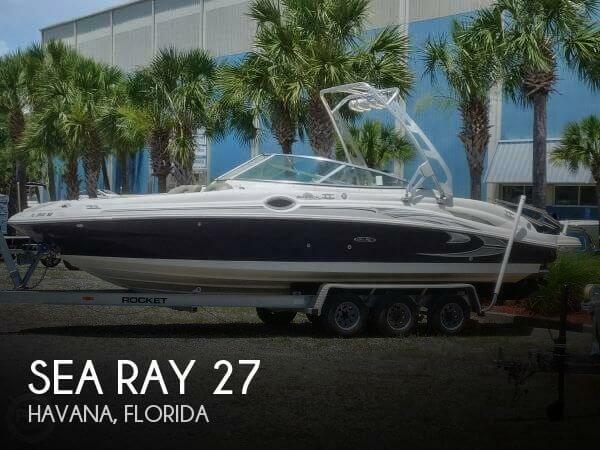 If you are in the market for a bowrider, look no further than this 2005 Sea Ray 27, priced right at $38,900 (offers encouraged). This boat is located in Havana, Florida. She is also equipped with a Chrysler engine. * * * Please note that no sales representative has visited the boat. All information regarding the vessel has been supplied by the Seller * * * The overall condition of the boat is said to be fair. The gel coat is said to be "normal" for a boat of this vintage. Sink water is inoperative. Front hatch needs replaced, broken hinge. Deck fill caps don't fit correctly. Trailer tires need replaced. Bimini does not fit well and is a non-matching color. 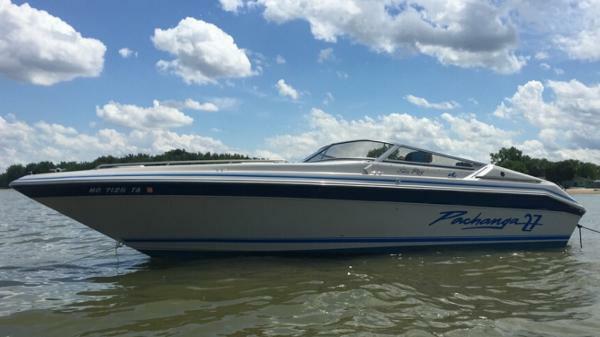 Stock #161144 Well-Equipped 1989 Sea Ray Pachanga! 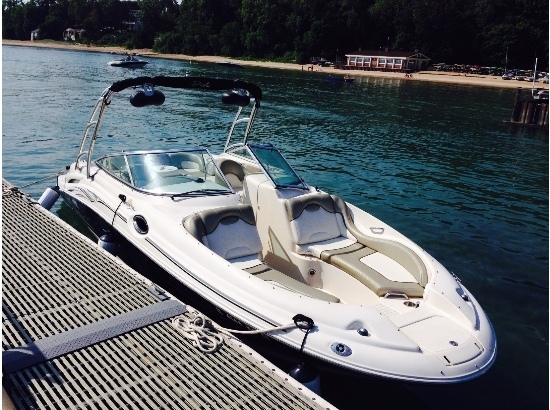 300 HP Mercruiser 7,4 Bravo One! Alpine AM/FM/CD With Changer! Bimini And Cockpit Cover! Tri-Axle Trailer! 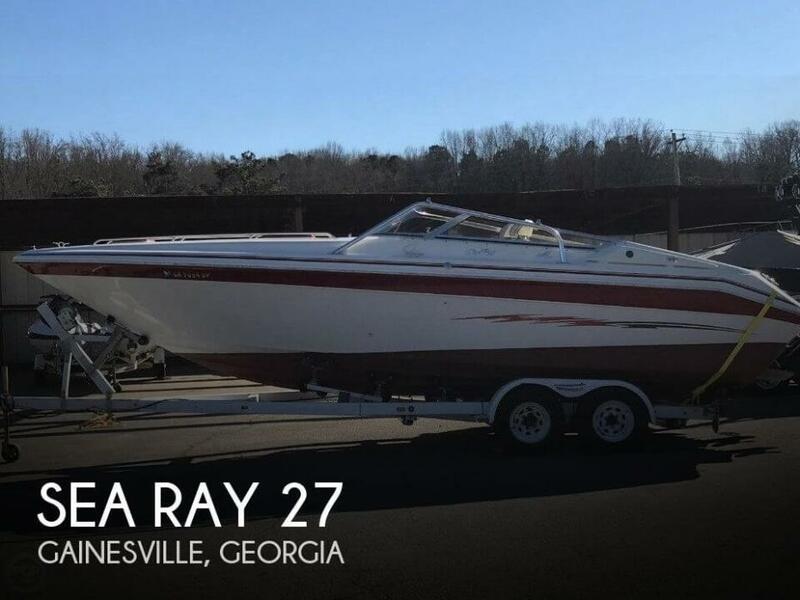 If you are in the market for an express cruiser, look no further than this 1989 Sea Ray Pachanga 27, priced right at $16,500 (offers encouraged). 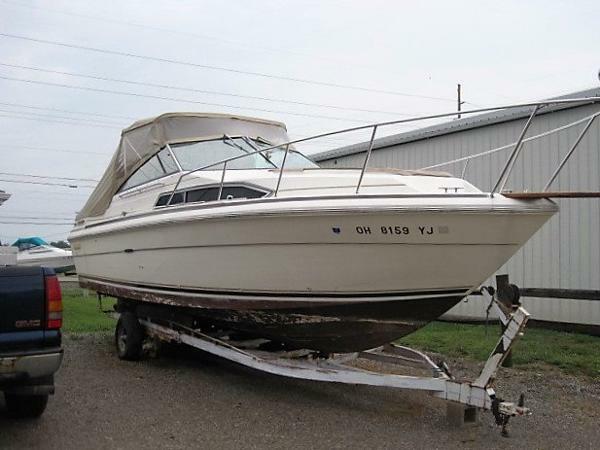 This boat is located in Springfield, Illinois and is in decent condition. She is also equipped with a Mercruiser engine. 1989 Sea Ray Pachanga 27 Pachanga Power! Classic performance and a great design add up to weekends of excitement aboard the venerable Sea Ray Pachanga 27. Along with her roomyt cockpit and seductive lines she also features a highly cruisable interior for weekend jaunts, fishing or fun with the family. 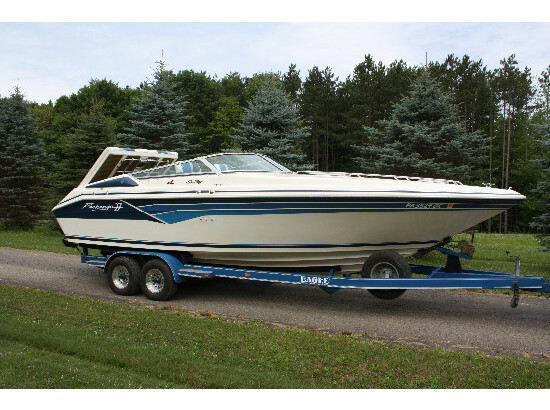 This example features the Marine Power V8 and a like-new (2 years old) Bravo 3 drive! A full featured helm with upright racing seats completes the serious look of this go-fast boat. Below deck you'll find comfortable seating, galley area, and a fridge. This is a boat that has been carefully maintained and it shows. Additional features: 2004 twin axle Venture trailer, fuel meters, flush system, AGM batteries, upgraded charging system, Sat. Radio and Much More! 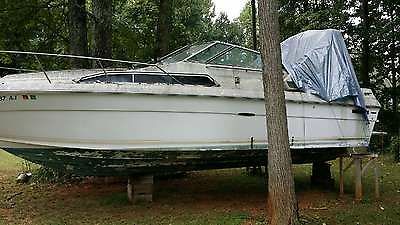 1988 Sea Ray Pachanga 27 1988 Sea Ray Pachanga 27. 468 C.I.D. Big Block Chevrolet Full Roller. 125 Hours On Motor/Drive Everything From The Oil Pan To The Carb Was Rebuilt Or Replaced 8/11, Bravo 1 "X" Mercruiser Sweepback Drive 1:50 Installed 8/11. Thru-Hull Exhaust, All New Striping/Logo's 5/2015. New Imron Blue Stripe At The Same Time.Interlux Interprotect 2000E Barrier Coat Covered In Blue VIVID Antifouling Paint. New Sunbrella Cockpit Cover 2012, Cuddy Cabin, Compass, Autometer Marine Carbon Fiber Gauges & Livorsi Bezels, Sony CD Player With Ipod Hookup Sub & Amp, Porti Potty.Tandem Axle Trailer Completely Redone Summer 2015, New Tires Bunks, Carpet, Brakes, Nothing Not Replaced. Everything Works As it Should. Boat Is Like New! Any Questions Call Justin. 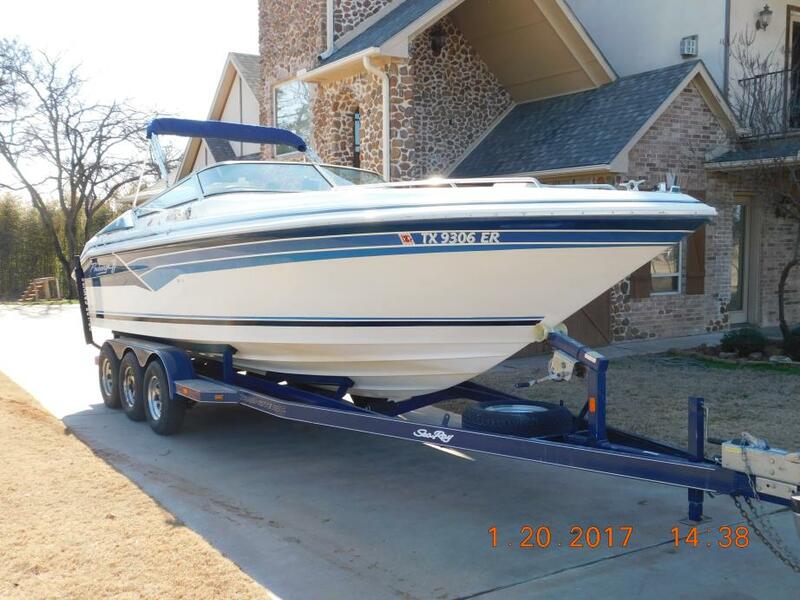 1989 SEA RAY PACHANGA 27' VERY CLEAN TURN KEY BOAT (NO HOUR METER BUT SURELY VERY LOW HOURS), IT IS 26 YEARS OLD SO IT DOES HAVE SOME NORMAL EVIDENCE OF USE BUT NOTHING ABNORMAL, CURRENTLY STILL IN DRY DOCK FROM SEPTEMBER OF 2014, SINGLE 454 BIG BLOCK ENGINE (NOT SURE WHICH HP. I'VE BEEN TOLD IT'S THE 365HP BUT ?? 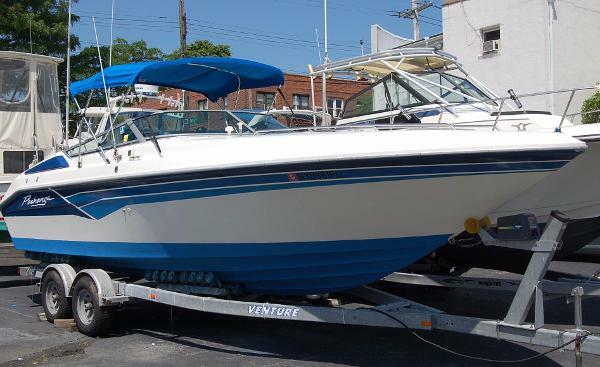 ), ONE OF THE ALL TIME ICONIC MINI OFF SHORE POWER BOATS EVER BUILT AND SOLD, VERY HARD TO FIND (HARDER YET TO FIND IN BEAUTIFUL CONDITION), INCLUDES TRAILER THAT I JUST USED FOR STORAGE BUT IS ROAD WORTHY, ENGINE PULLED AND MOTOR AND HULL COMPLETELY GONE THRU IN AUGUST OF 2012. INSTALLED NEW GIMBEL BEARING AND GIMBEL BEARING HOUSING, COMPLETELY REBUILT THE OUTDRIVE (MAYBE 2 TANKS OF GAS SINCE THE GO THRU IN 2012), NEW COMPLETELY REBUILT REAR SEAT FRAME USING 1/2' MARINE PLYWOOD (SPRING OF 2013)(STOCK PLYWOOD IS 3/8"), NEW REAR SEAT COMPLETELY RE-UPOLSTERED WITH PACHANGA LOGO EMBROYDERING ON CENTER OF THE SEAT BACK, NEW BRIGHT BLUE CANVAS (2013), GREAT STEREO SYSTEM WITH BIG AMP (I THINK PIONEER BUT NOT POSITIVE) WITH CAPTIAN'S CONTROLS AND STERN CONTROLS WHEN CHILLIN' ON THE SWIM PLATFORM, SHOWER ON THE SWIM PLATFORM. ONLY USED IN FRESH WATER, THE FIRST OWNERS WERE THREE LAYWERS THAT KEPT IT ON LAKE MICHIGAN AND IT MOSTLY SAT AT THE DOCK BECAUSE THEY APPARENTLY ARGUED OVER WHO WAS RESPONSEABLE FOR WHAT (IMAGINE THAT OCCURING WITH MULTIPLE OWNERSHIP. WE HAVE BEEN USING IT ON LAKE ERIE. HANDLES ROUGH WATER WITH NARY A CARE (CUTS THRU 3 - 4 FOOTERS LIKE BUTTER). 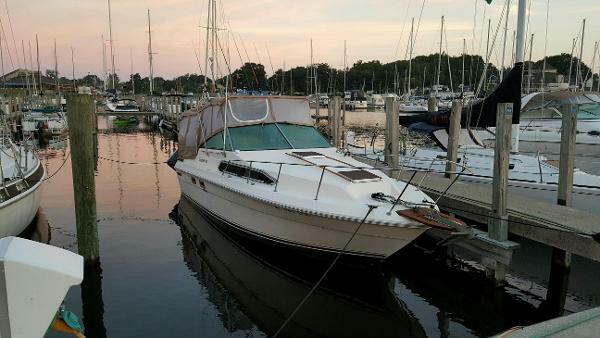 PROFESSIONALLY MAINTAINED, ADULT OPERATOR THAT HAS BEEN A BOAT OWNER FOR YEARS. THIS IS A GORGEOUS BOAT AND BEEN MY FAVORITE. I'M NOW 67 YEARS OLD, MY KIDS ARE ALL GROWN AND GONE AND NOW IT'S JUST MY WIFE AND I. THE PACHANGA IS SIMPLY TOO BIG AND TOO EXPENSIVE TO DOCK, OPERATE, AND STORE FOR JUST THE TWO OF US. 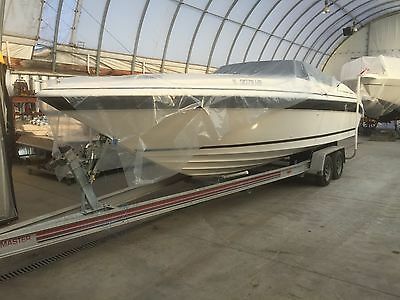 BUY WITH THE CONFIDENCE THAT YOU WILL BE GETTING A FANTASTIC BOAT WITH COLLECTOR POTENTIAL. LIKE I SAID EARLIER, THEY'RE HARD TO FIND. QUESTIONS OR COMMENTS PLEASE CALL GEORGE AT 724 544-0221. 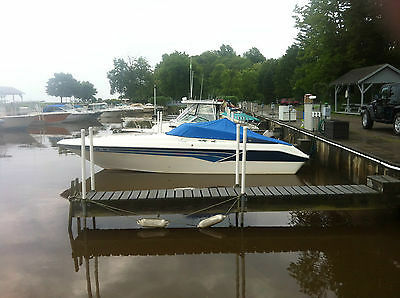 1981 Sea Ray Sundancer NEED TO SELL ASAP! OFFER ME A PRICE AND YOU MAY BE LUCKY! Needs a lot of TLC. I bought this boat and just couldn't fix it. Cabin was already being redone by previous owner. Has a engine wrapped up and sitting in the boat. I never unwrapped the engine. It's missing a lot of pieces that's why I'm selling so cheap. Want it to go to someone who will fix it up and take care of it. We can complete the sale either by paypal or cash in person. The boat is currently at my mothers house in the back yard. I tried to keep it covered for the most part. Please don't bid unless you are seriously buying. Relisting due to bidder not paying. 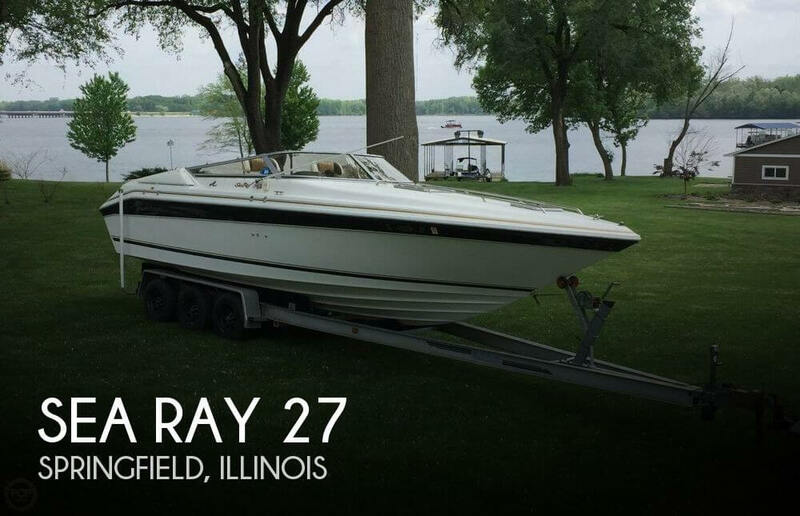 1981 Sea Ray Sundancer NEED TO SELL ASAP. NO RESERVE HIGHEST BIDDER TAKES IT!